The Graduate School of Advanced Integrated Studies in Human Survivability (GSAIS) is an integrated doctoral program with a standard study period of five years. The conditions for the completion of the program include enrolling for five years or more, acquiring the prescribed credits, receiving the necessary research guidance, and passing the doctoral degree thesis evaluation and the relevant examination. The doctoral of degree philosophy is awarded once the completion requirements are met. The curriculum consists of two phases; the first phase consists of research in a specific field along with the courses and service learning across a wide range of fields, and the second phase consists of conducting more trans-disciplinary research on human survivability that includes practical implementation of the research outcomes. The main objective of the first phase is broadening perspectives while building expertise and that of the second phase is engaging in the integrated studies on human survivability. To progress from the first phase to the second phase, it is necessary to pass the Qualifying Examination (QE), which is conducted after the end of the second year. 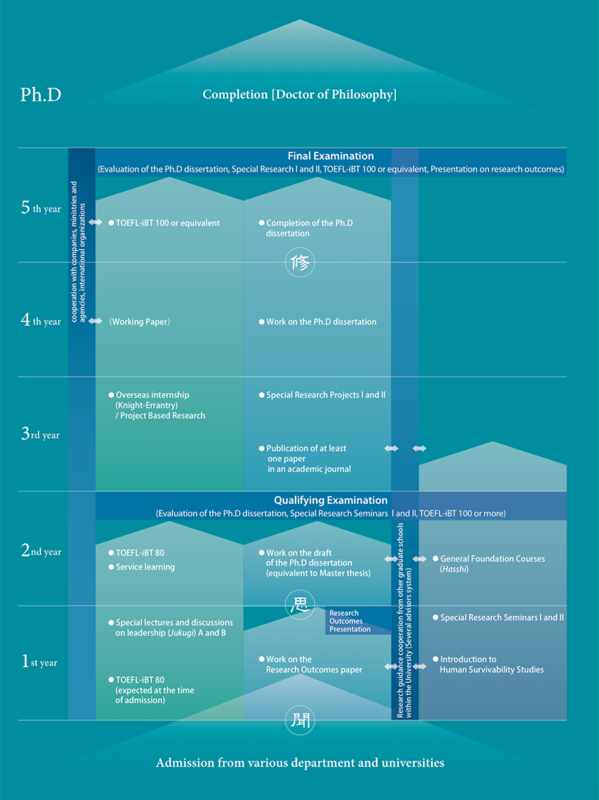 The requirements for the QE include acquiring the prescribed credits (more than 16 credits in the compulsory subjects and more than 14 credits in the elective subjects for a total of more than 30 credits) and receiving the necessary research guidance combined with a language proficiency of TOEFL-iBT80 points. GSAIS adopts a multiple guidance systems. Research in a specific field is conducted under the guidance of GSAIS’s faculty members and the collaborative professors within Kyoto University. If specialized facilities such as experimental devices are required, GSAIS and the whole university offer necessary support to find available facilities in the collaborator’s departments. For the trans-displinary, integrated studies in human survivability (i.e., the later phase of the curriculum), research guidance and advice are provided by multiple fulltime faculty members. At GSAIS, there are “integrated study groups” in which faculty members and students from various fields participate to study a global issue by integrating the different approaches. Many students are affiliated with multiple research groups and are engaged in collaborative research with other students and faculty members from different fields. Taking into consideration the specialized field of each student, the first and second years consist of specialized courses equivalent to a master’s program at an ordinary graduate school. The specialized subjects are categorized into social science and natural science subjects as compulsory electives. Further, for the selection of common basic subjects from the first to the third year, taking into consideration the basic knowledge and expertise necessary for each subject, fulltime faculty members provide tailor-made course guidance and if necessary advise students to take courses offered by other graduate schools. In addition, in the first and second years, there are service learning and what we call Jukugi (deliberation), a series of in-depth discussion with the top leaders from industry, government and international organizations. In the fourth and fifth years, students must conduct an oversea internship and a project-based research (non-Japanese students may do their internship in Japan). There are also frequent seminars and workshops inviting lecturers from the industrial and government sectors, through which students can acquire practical learning that connects research and social implementation and international human networks leading to career paths after completion. Those who are employed at public offices and in corporations (excluding those who receive salaries and are exempt from their duties) and those who are self-employed, that is, those who are fulltime workers and can systematically undertake long-term study, can apply for long-term study after deciding to enroll. If the candidate is allowed to take the course as a long-term student after screening, the length of the course of study will be 10 years.